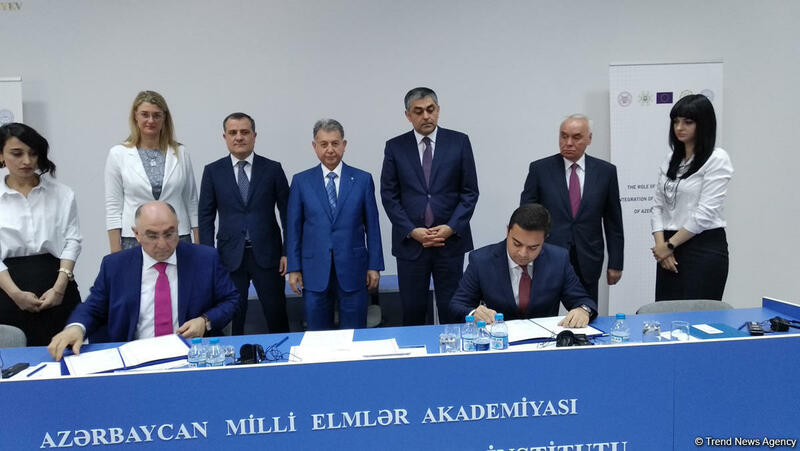 The Educational Network of the Ministry of Education of Azerbaijan - AzEduNet and National Research and Education Network of the Institute of Information Technology of the National Academy of Sciences (ANAS) - AzScienceNet have signed a cooperation contract. The agreement stipulates the integration of AzEduNet to the AzScienceNet network, which will provide an opportunity for the Ministry of Education specialists to get access to AzScienceNet services, as well as to exchange information between universities and other educational institutions of the country. The document was signed by the Director of the Department of Informatization of the Education System of the Ministry of Education of Azerbaijan Vusal Khanlarov and the Director of the Institute of Information Technology of ANAS Rasim Aliguliyev. AzEduNet has the largest corporate network in Azerbaijan, and about half of secondary schools in Azerbaijan have access to the Internet through the AzEduNet educational network. The data transfer rate in the AzScienceNet network is one gigabit per second. In addition to the AzEduNet educational network, about 40 structures of the Academy of Sciences also have access to AzScienceNet.